Fischer Dance is a dance theater company founded in South Bend, IN now operating out of Salt Lake City, UT. The South Bend version of the company pioneered an audience for modern dance in a region without independent choreographers, directed by Hannah Fischer. After four years (2014-2018) and over 40 public performances, the traditional company model transitioned to New Industry Dance, steered by the former Fischer Dance company. Hannah Fischer and company continue to make collaborative work nationally and internationally with headquarters in both Salt Lake City and South Bend. The work of Fischer Dance asks how we can be available to each other, how we find each other. Artistic director Hannah Fischer is committed to a rich collaborative process, ongoing community engagement, and utilizing a wide array of public spaces and integrated technologies. Through movement laboratories, audience engagement, and community casts, the dance work asks questions surrounding the complexities of human relationships in our contemporary world. The performing company consists of performers with diverse backgrounds, often recruiting a community cast to work with the company. If you are interested in participating in a project with us, visit our Work With Us page. Photo by Grant Beachy Photo. Hannah Fischer launched Fischer Dance in 2014 to create space for contemporary dance-making in South Bend, IN. 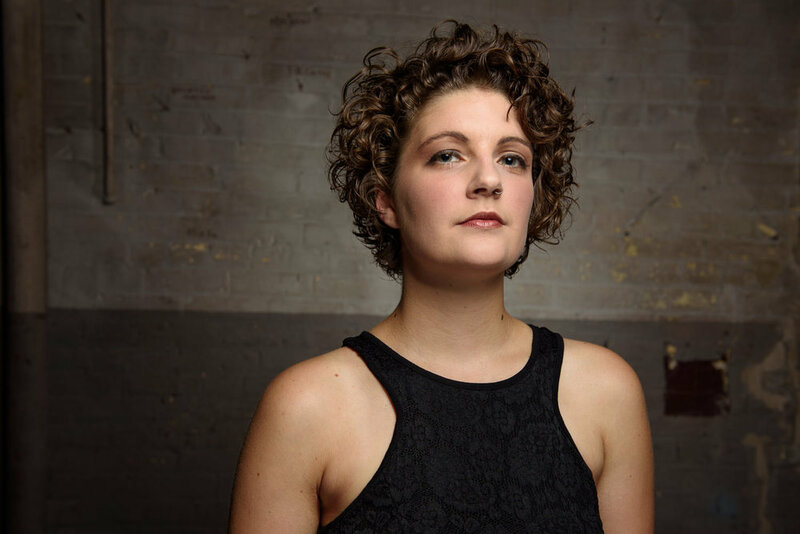 Before launching Fischer Dance, she spent three years in St. Louis, MO with Leverage Dance Theater as their assistant director and production coordinator. Thanks to Leverage, Hannah has experience working in public schools with arts-integration, as well as working with underserved youths in the juvenile system and residential care. Hannah has had the pleasure of working closely with some of her modern dance-making heroes; Victoria Marks, Susan Marshall, David Dorfman, Kim Epifano, Jane Comfort, Nejla Yatkin, Matthew Janczewski, Donna Uchizono, Bridgman|Packer, KJ Holmes, and Nancy Stark Smith. In 2017 Hannah received an Individual Artist Grant through the Indiana Arts Commission. Earlier in her career, Hannah was awarded support through the Margaret Hill Visiting Artist Endowment, the Fauman Foundation Fund, the Catherine-Dooley Grant for Peace and Justice, and was an Associate Artist in Residence at the Atlantic Center for the Arts in 2014. In her dance-making, Hannah is collaborative and inter-disciplinary, believing firmly that dance has the power to transform a community. Up until 2018, Hannah was the only modern dance-maker regionally, paving the way for New Industry Dance. Her specialties are in community engagement, immersive performance experiences, and integrated media and dance. After four years of producing independent dance work in South Bend, Indiana, Hannah now resides in Salt Lake City, Utah as she pursues her MFA in Modern Dance at the University of Utah. Patrick Quigley has been making music for over 15 years. From ska to punk rock to looping instrumentals, he can create any atmosphere with sound. In addition to creating music, Patrick also creates space for other musicians in the South Bend community. He runs an underground venue in River Park, The Well, and helps spearhead River Lights Music Festival each year. You may know Patrick through Analecta, Boy Rex, or Sailbear, to name a few other projects. Patrick and Hannah have been collaborating for 9 years. Jeff Wallace is based in Lafayette, Indiana, USA and has been accumulating experiences through movement teaching and performance for over 30 years. His primary influences are Contact Improvisation, Contemporary Dance, Physical Theater, his past career in neuropsychology, and his autistic son. He has taught at numerous colleges, universities and movement festivals, and has performed and taught on 5 continents and in 13 countries. Jeff ‘s performance credits include the US premiere of Tino Segal’s installation of Kiss at Chicago’s MCA, the development and premiere of Adam Noble’s physical theater work Terminus, the premiere of Karl P Henning’s concert work Ambiguous Strategies – Composition for clarinets, violins, percussion and dancer, and Sally Wallace’s Tides and Solitude at the Kennedy Center. He has performed numerous other choreographic and improvisational dance works in venues including the Kennedy Center, the Dora Stratou Theatre in Athens, Club M and the Morishita Studios in Tokyo, the National Opera House in Guatemala, and The Mermaid Art Centre in County Wicklow. In 2015 Jeff co-curated the dance component of Dublin’s First Fortnight Festival. Johan Godwalt received his BA in Philosophy and Theatre from Northwestern College in Orange City. IA. He holds an MFA in Design and Technology from the University of Missouri Kansas City, with emphasis on Technical Direction and Lighting Design. Johan serves as Associate Professor of Scene Design and Technical Direction at Bethel College in Mishawaka IN. Has taught at Mankato State University, Loyola University in New Orleans, and the State University of New York at Oswego. He has beens awarded the Faculty Lighting Design Intensive from KCACTF and the Chancellor's award from the State of New York. 2010 // September - November // Fischer creates Caught, an interdisciplinary evening-length performance for her undergraduate comprehensive performance project. Caught is created with Patrick Quigley, laying the groundwork for a long collaborative relationship. The show receives great reviews from campus and is picked up by LangLab South Bend, an incubation space. 2010 // December // LangLab South Bend presents Caught. 2011 // Fischer receives her BA from Saint Mary’s College and moves to Saint Louis, MO to work with Leverage Dance Theater. 2014 // Hannah returns to South Bend and begins developing When We Were There at LangLab South Bend. The cast is comprised of Greg Fox, Susanna Frusti, Luke Fischer, Hannah Fischer. Patrick Quigley accompanies the show with Chris Arrowsmith and Joel Fischer designs video feedback projection. Halfway through the process a community cast is recruited. Sophia Zovich, Ridge Alencar, Evan Bryson, Kristy Godot, Jing Zhu. 2014 // December // When We Were There premieres in the Annex at LangLab South Bend. 2015 // March // Fischer Dance is officially announced as a performing company and LLC. 2015 // March // When We Were There is presented at Clay High School for the magnet students. Cast: Greg Fox, Luke Fischer, Hannah Fischer, Evan Bryson, Ridge Alencar, Jing Zhu. 2015 // April // When We Were There is presented at the Birdsell Mansion by The Birdsell Project. 2015 // June // Fischer Dance travels to St. Louis to perform When We Were There in the Fringe Festival. Cast: Greg Fox, Luke Fischer, Hannah Fischer, Cait Redmond, Ridge Alencar, Niche . November 13, 2015 // Mass violence in Paris. The news story catalyzes the planning of the next season. 2016 // January // Movement Lab launches in South Bend. 2016 // February // Hannah Fischer creates Pillars at Saint Mary’s College, a piece that becomes part of Fischer Dance repertory. 2016 // March // Fischer Dance acquires access to the JC Lauber Building and begins developing Mercy/Shelter. Hannah Fischer develops Works in Progress. 2016 // May - July // Fischer Dance presents Works in Progress in collaboration with The Birdsell Project. High emphasis placed on community dialogue surrounding ideas of ‘art as activism’ and the state of the arts in South Bend. 2016 // August // Mercy/Shelter premieres at the JC Lauber Building. Cast: Anna Greenawalt, Chloe Ilene, Lisa Hayes, Nick Dolezal, Joanna Whitmyer, Hannah Fisher. Music by Patrick Quigley. Lights by Johan Godwalt, costumes by Jennifer Stevens, video projection by Eric Souther, and camera operation by Joel Fischer. 2016 // October - November // Works in Progress continues for two final months. December 2, 2016 // Ghost Ship fire in Oakland, California. The tragedy has ripple effects across the nation to South Bend, where Fischer Dance loses access to JC Lauber, as did many small arts organizations across the country after the incident. 2017 // April // Fischer Dance collaborates with Saint Mary’s College and Hannah choreographes a new original play by Casey Whitaker, Lucky, Liar, Loser. Fischer Dance becomes a recipient of the Margaret Hill Endowment through Saint Mary’s College. 2017 // June // Take Me With You premieres at Saint Mary’s College. Cast: Anna Greenawalt, Chloe Ilene, Lisa Hayes, Joanna Whitmyer, Sharon Sims, Maia Sutter, Lena Polzonetti, Nick Dolezal, Hannah Fischer. Lighting by Jen Kazmierciak. Music by Patrick Quigley. 2017 // June // Hannah Fischer receives an individual artist grant for the company through the Indiana Arts Commission. She is one of two artists in South Bend to receive this award. 2017 // September // Fischer Dance announces the fourth season and begins developing Small Batch, Holding Space, and The Listening. 2017 // December // Small Batch premieres at South Bend Civic Theater. Fourth season company performs: Mallory McAfee, Maia Sutter, Nick Dolezal, Anna Greenawalt, Chloe Ilene, Joanna Whitmyer, Sharon Sims, and Hannah Fischer. 2018 // January // Nesting premieres at The Music Village. Guest artists Terri Hron performs with the company: Anna Greenawalt, Sharon Sims, Chloe Ilene, and Hannah Fischer. 2018 // March // Holding Space premieres at LaSalle Body Shop. The dance for camera series is created in collaboration with Corlanthum and Sailbear. Full company performs in the 9-part series alongside a community cast of over 30 individuals. 2018 // May // The Listening premieres at 702 South Michigan Street. The project was funded in part by the Indiana Arts Commission. 2018 // July // water/skin premiers at Notre Dame Shakespeare Festival. Performed by Jeff Wallace and Hannah Fischer, live original score by Patrick Quigley and lights by Johan Godwalt. July 27, 2018 // NEW INDUSTRY DANCE emerges under the direction of Chloe Ilene. The South Bend artists of the former Fischer Dance stay on to work under the new name. Hannah Fischer relocates to Salt Lake City.